The City of Toronto Planning Department has published a set of demand projections for various combinations of the (Downtown) Relief subway line, SmartTrack, and the proposed northern extension of the Yonge line to Richmond Hill. This document makes interesting reading because it shows both the status of the evolving master transit plan that went into the modelling, and the vital point that additional capacity into the core area is essential to prevent complete gridlock on the subway system. Both SmartTrack and the Relief Line are essential to a future transit network. That said, the report raises several issues in part by what it does not talk about, specifically some of the network configurations that have already been presented in various studies. This question of the Relief Line’s alignment is subdivided into two parts: what is the scope of the line, and which route will it take to link Danforth to the core area. Work has focussed on the “little J” because that is the scope for a Relief Line so long discussed, and approved for study by Council. Therefore the model numbers do not show any effect of taking the “little J” further north to intercept more traffic bound for the Yonge line. This has already been reported by Metrolinx as a very beneficial extension to the RL. The north-south segment could lie on either Pape of Broadview. The Don River crossing could be at Queen, or further south to allow the line to serve the Unilever site. The route into the core could be via Queen or King. A northern route via Queen makes for a simpler river crossing, but the southern route picks up a major new employment district. The King Street route into downtown also attracts more riders than a Queen route. City Planning staff have erroneously talked of a King route as if it could only exist as part of the southerly Unilever site alignment, when their own study clearly shows the option of a route crossing the Don at Queen, and then veering into King Street. The more northerly crossing is preferred because it will be easier to build under the river at a narrower point. Of these, the two most promising were the Pape to Queen options with the only variation being whether the line ran to downtown via Queen or via King after crossing the Don at Queen Street. For this article, these are the only two whose demand projections I will discuss. The SmartTrack cases used a modified land use plan that assumed SmartTrack itself would cause growth that would not otherwise occur. This causes increases for the Relief Line’s projected demand when it is matched with a the lower level of SmartTrack service (4 trains/hour) because the latter does not attract as much riding as the Relief Line. All model runs used a Scarborough Subway (SSE) with its original three stops, not the “optimized” version serving only Scarborough Town Centre. The disconnect between what is modelled and what is proposed indicates that some of the plan’s elements have changed very recently. The model is supposed to catch up to the plan in future iterations. None of the SSE or ST figures are included in this report, and so we cannot see how the model divided up demand between them, albeit with the “wrong” station configuration. Finally, the Richmond Hill extension was added to the model networks to see how it would affect demand on the critical downtown segment and Bloor Yonge Station. With the RL ending at Danforth, the potential benefit (and hence RL demand) of the “big J” is unknown. The five-minute service on SmartTrack, identified in a previous study as essential to attract riders, may not be physically possible given constraints on sharing the network with GO. It is unclear whether SmartTrack will actually operate at no fare premium above local TTC services, another essential component of making this service attractive to riders. The effect of SmartTrack in the downtown segment, including the degree to which it would duplicate an RL at the Unilever site, depends on the ability to operate frequent ST service. The relative roles of the Scarborough Subway and SmartTrack in attracting riders is unknown because the now-proposed station layout has not been modelled. That is a long list of variables. Many of these will be addressed in updated model runs expected in coming weeks, but readers should be careful not to take the current model output as definitive. Nonetheless, the report concludes that treating SmartTrack and the Relief Line as options is misguided because both will be required to accommodate future demand to 2031 and beyond. Addition of the Richmond Hill extension to the mix will exhaust the Yonge line’s capacity by 2041. This makes further study of the “big J” quite important. Once upon a time, TTC management claimed a much higher target for subway capacity with trains running as often as every 90 seconds. This was impractical and is no longer considered a realistic goal. However, the higher claimed number, plus a drop in system demand with the 1990s recession, allowed the TTC to dismiss the need for a Relief Line as an essential future component in the network for many years. System capacity is not just a question of how many trains/hour can move along the track, but of capacity for passenger movement at stations. This is important for the ability to clear platforms between trains (a similar challenge exists with future GO/SmartTrack service levels at Union) and especially for transfer capacity at Bloor-Yonge. Diverting demand away from that transfer point not only lessens crowding, but also could avoid the need for a billion-dollar retrofit and expansion at that station. Demand on the Yonge line is constrained by train capacity, and if it is not possible to board, people will seek other routes or modes. Many of the modelled networks show less reduction in peak demand on the Yonge line than new demand on the SmartTrack and/or Relief Line corridors. This happens because any “relief” allows the Yonge line to backfill with today’s unmet demand. In effect, space on Yonge is purchased by building capacity elsewhere and redirecting traffic. 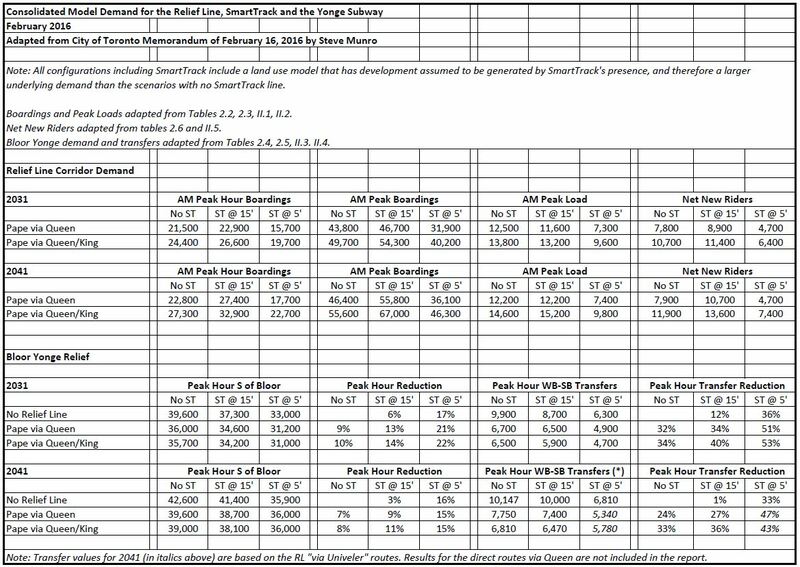 The table below summarizes many of the model configurations for the RL alignments from Pape Station to downtown via a Queen Street crossing of the Don River. Networks without SmartTrack, and with two different ST service levels are also included. The assumed headway on the RL is 3’00” (20 trains/hour). “Boardings” count the number of people who get on the RL at some location. The Peak Load values vary considerably with an obvious effect where frequent ST service draws demand away from the RL. This observation must be tempered by the unknown potential effect of the “big J” version of the RL that would serve a part of Toronto where ST is not a competing factor. “Net New Riders” shows an estimate of the riders who are new transit users, as opposed to those diverted from existing routes. It is unclear whether this includes only riders on the RL, or additional riders on the Yonge line taking advantage of new capacity there. 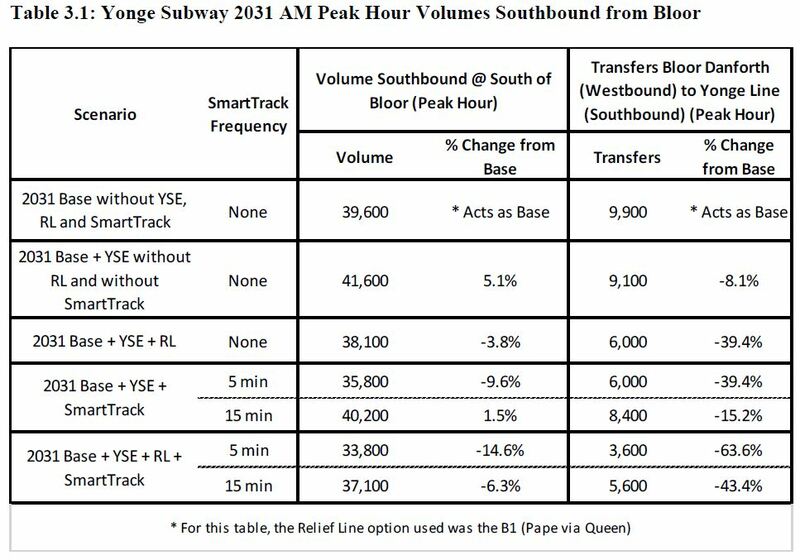 The peak demand south of Bloor Station for many configurations is at or above the Yonge line’s expected capacity of 36,000/hour. The situation is even worse when demand from the Richmond Hill extension is added (see following section). An important effect of both the RL and ST traffic diversion is the reduction of the busy west-to-south transfer movements at Bloor-Yonge. This is important because the TTC has a billion-dollar proposal to expand capacity at this location, a project that might prove unnecessary if transfer traffic through the station can be reduced. That saving would be an offset against the cost of any new line providing that relief. Not included in the published information is any analysis of transfer traffic at Pape-Danforth station which would take over part of the function of Bloor-Yonge. This will be sensitive to the configuration of RL used because a “big J” would pick up many riders north of Danforth rather than having them board from feeder buses or the Danforth subway at Pape. Peak boardings are higher on the RL with the SmartTrack 15′ service as compared to no ST because new developments are included in the land use for those version of the model run. The developments attract riders, but they wind up preferentially on the RL because it would operate at a much shorter headway. Conversely the peak point loads do not change much indicating that the “ST-related” development is adding to demand that is counter-peak, or at least not flowing through the peak point. In other words, as more capacity is added to the network south of Bloor Street, the congestion point shifts north of Bloor Station. Building new capacity only for riders south of the Bloor-Danforth subway will not address the heart of the problem, the volume of traffic originating to the north. 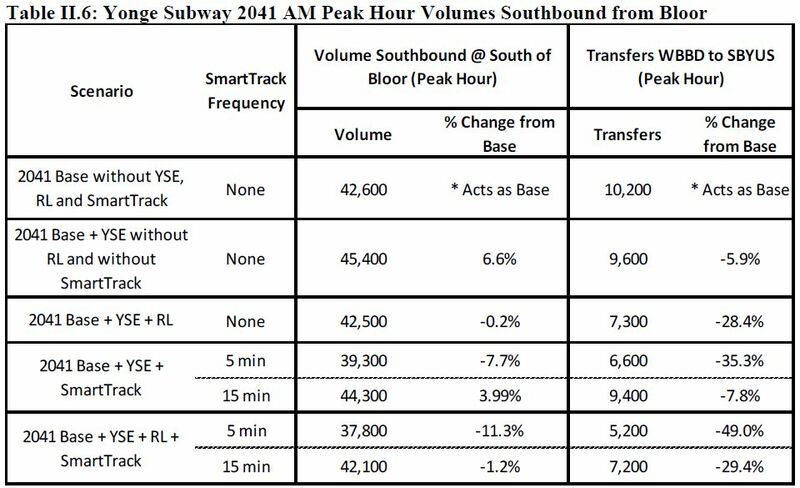 When the YSE is added to the mix, peak demand at Bloor southbound increases from 39,600 to 41,600 in the model. However, both of these numbers exceed the line’s capacity, and the added congestion shows up as a modelled drop from 9,900 to 9,100 for transfer movements from the Danforth subway. Congestion on the subway clearly would limit the attractiveness of the extension, especially for today’s riders of the subway. Although total riding projections only rise marginally, this will almost certainly occur by displacement of riders who now board further south. All of the configurations modelled here show a Yonge line operating above capacity by 2041 when the YSE is included. 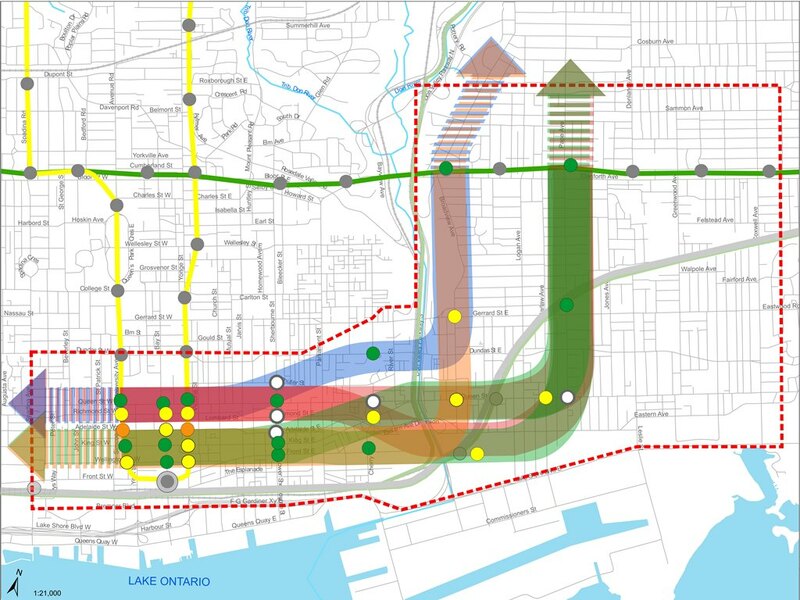 From Metrolinx demand projections published in June 2015, we know that the “big J” would attract considerably more demand than the “little J” away from the Yonge line. Although the combination of SmartTrack and the Relief Line, as well as planned additional capacity on the Yonge Subway itself, go well toward resolving the capacity problem on the existing network by 2031, the effect is not lasting. Moreover, the entire plan depends on the attractiveness of SmartTrack running on five minute headways and at a TTC fare. The Relief Line’s ability to attract new riders is constrained by its primary role as a bypass link from Danforth to downtown, especially on a route that avoids the potential new development at the Unilever site. Whether this statement would be true for the “big J” route to Eglinton or beyond is another matter as this would bring rapid transit service to an area that does not have it today. We must await further model runs to see how this works out. This entry was posted in A Grand Plan, Downtown Relief Line, SmartTrack, Subways, Transit, Yonge Subway Extension. Bookmark the permalink. Both SmartTrack and the Relief Line are essential to a future transit network. Steve: That’s why the “Big J” is so important. We need to know what it can do if SmartTrack cannot achieve frequent service. We will need it eventually, but may need it sooner if ST does not live up to expectations. Steve, my concern with this study has always been that the “little J” being studied will be the be all, end all for the DRL, and to get it extended in any direction, (especially north past Eglinton) if this is built at all, will require another herculean effort and momentum that may take decades in this city. I guess the most obvious question is why doesn’t everyone involved study the “big U” only and build one very large line instead of the stub (albeit, an important stub)? Am I wrong about the first part and ignorant with the second part? Steve: The problem has been that the TTC for years said “we will never need more than the “little J” so why waste money studying more. The terms of reference for work now underway were set on that basis. Much valuable time and research that could have set the stage for a larger RL was lost thanks to this shortsighted view. Now we are catching up. 1. The relief line is a must in any scenario. 2. It should be designed to accommodate a large J (to Eglinton) alignment sooner or later. Preferably sooner. This will reduce pressure on the Eglinton/Yonge subway station and enhance the value of the Crosstown LRT. 3. A Pape alignment would thus seem to have an advantage over Broadview, as it would line up more naturally with Eglinton/Don Mills. 4. And because, for most riders, it would shorten their commute by a stop. 5. It would be a shame if the relief line failed to serve the Unilever property. So let’s get that part right. 7. Whether the relief line follows King or Queen, the other road should be considered for a dedicated streetcar line. 9. To the extent that heavy rail is offered up as our tool of choice in driving property development and determining the kind of city we want to build, it seems like a bad idea altogether. Steve: It really is time to call out SmartTrack and its ne’er-do-well trio of proponents who advised John Tory it was a good idea. The original scheme was more interested in making real estate in Markham and south of the airport more valuable than it was in dealing with the transit system’s problems. Many of the problems you describe flow directly from the machinations of the Tory campaign’s brains trust. I will turn to the detailed evaluation of RL alignment options in a separate article. Addition of the Richmond Hill extension to the mix will exhaust the Yonge line’s capacity by 2041. Anyone who has been on the Yonge line during peak hours know that its capacity is exhausted in 2016. Which leads me to suspect that the TTC’s definition of “exhausted” is somewhat different than the passenger who can’t get on the next train. Does the TTC believe that if I can get on a train at 1:00 AM then the line’s capacity is not “exhausted”? Steve: There will be substantial additional capacity with automatic train control sometime in 2019. The Vaughan extension will divert some traffic now using the Yonge line to the Spadina-University route. That said, things will be tight for the foreseeable future especially if SmartTrack’s promises for much additional capacity don’t prove workable. I just love the volume assumptions – they give a base figure and then add in the YSE to all the projections as if the YSE is a fait accompli! Lets back off the YSE figures and see just what kind of numbers we get. And who says the YSE is the best way to go? York region wants the YSE to link into its Richmond Hill terminal at Yonge and 7. There is a GO station there and with two-way all day service, could provide a faster (not cheaper) run to Union. The right type of fare integration could offer relief to the Yonge line. Ridership figures for GO, ST and a DRL (the Don line) together and in isolation would be informative. I suspect Toronto planning of “worst case” figures to get political attention as they have left this on the backburner way too long. How timely it was for the G&M to write about the success of King Street this past weekend, kindly pointing out the presence of over 50,000 jobs in the King-Spadina and King-Parliament districts with more to come. And can we finally find a better name for it? If funding for phase 1 can be secured by next year then perhaps we could call it the sesquicentennial line? If that is too much of a mouthful how about the plain old centennial line to mark the 100 or so years since the first incarnation of this line? In the past there was a fellow around here (I believe he ran for office in the downtown district) who liked to push the idea of a line under Parliament with the goal of saving money by having the line head to the Don Valley for points north of Danforth and the secondary benefit of adding system redundancy. I pointed out Pape had the big advantage of being east of the Chester crossover and in the event of maintenance closures or emergencies the Danforth line wouldn’t be completely disconnected from downtown. The best way to provide Downtown Relief is through SmartTrack, increased streetcar service from Broadview/Main to Dundas West, and BRT on the DVP but no, we want “subways, subways, subways”. Do we even need to worry about the YSE? It seems more and more like the Queen Subway in that it will never be built. As much as it is an on-paper idea the the thought of it overloading the Yonge line prevents its development. We cannot realistically build another extension on Yonge until there are shovels in the ground for the DRL. It would be like putting the cart before the horse in that you would overload the Yonge line before having the ability to deal with it. This will play out like the Queen subway. By the time things get underway so much time will pass and things will change and it will never be built. Just my five cents but the YSE will never get built. York region wants the YSE to link into its Richmond Hill terminal at Yonge and 7. There is a GO station there and with two-way all day service, could provide a faster (not cheaper) run to Union. The right type of fare integration could offer relief to the Yonge line. Actually, both faster AND cheaper – at least when paying cash. Currently, the YRT+TTC fare between Richmond Hill Centre (Langstaff GO) is $7.25 cash, or $6.30 for tickets/tokens/Presto, and it takes about an hour to an hour and a half. The GO fare for the same trip is $7.15 cash, or $6.35 using Presto, but the trip only takes about 40 minutes (bus or rail). Both used to be cheaper, but for some reason the recent increase in GO fares have Presto users paying a nickle more on GO than on YRT & TTC. The DRL and Don Mills Rapid Transit should either merge or connect with each other. The GTA Weekly Pass would cut the local transit price more: $61 per week, or $6.10 one-way ($5.19 after the tax credit). However, if you are commuting regularly (4 weeks per month), then GO becomes cheaper once again at $226.55 vs. $244.00 for the GTA pass (it’s worse on a yearly basis as you need $2,718.60 on GO and $3,172.00 on the GTA weekly pass). At that point, you can even get the GO Co-Fare on YRT to complete your trip for cheaper: $3,110.10 vs $3,172.00 per year. From Richmond Hill GO, it’s $7.25 cash or $6.44 on Presto, and $229.80 per month. It’s crazy how small changes in your travel patterns will dictate the best price form. Do we even need to worry about the YSE? As much as it is an on-paper idea the thought of it overloading the Yonge line prevents its development. First of all, never underestimate political will for a vote-buying white elephant. Second, you can make the “traffic gridlock” argument that by displacing riders in the “core”, who have both better access to transit and shorter journeys, that you will improve traffic, transit ridership, and carbon footprints. Patrick Brown seems to be taking the OPC party in a populist direction, so a Richmond Hill Subway might be on the menu. I would prefer a north south line separate from an east west line connecting say around Pape and Queen or wherever most appropriate. Steve: The whole idea of a “relief” line is to give a fast run into downtown from the east, not require a double transfer (BD to Don Mills to Queen). What I find surprising is that peak ridership projection for the City’s preferred RL route (Pape via Queen) is around 7,000, and the projection for Pape via King with Unilever stop is 17,400. That has to be one expensive crossing of the Don to not make Pape via King the obvious favourite. Steve: You have confused two different figures. One is a peak load value, the other is peak hour boardings. All the same, the directly comparable figures generally show the route via Unilever doing better as this picks up a major employment node, even if SmartTrack is part of the equation. If SmartTrack at 5′ is impractical, the whole idea of using Queen as the east-west link will fall apart. And the longer the RL ends up being extended north, the more shortsighted missing Unilever and King will be. Same goes for any westward extension no matter how stubby or connection to a 2nd rail hub. Steve’s preferred route for the RL along Wellington improves the more hard info we get. I really look forward to seeing the numbers once the ‘big J’ forcasts are in. I’d like to see ridership comparisons for termini at Eglinton, Sheppard and Finch. Steve: I too hope to see numbers for the “Big J” given the huge effect it had in the Metrolinx figures last year. If they do not model it to Sheppard, one will have to ask why such an obvious possible benefit is being ignored. Yes, we should be worried. Yonge is swamped during peak hours today with buses south of Steeles. Yonge needs an LRT up to some point north of 7, but it makes more sense to build subway to Steeles ASAP and to 7 later when the LRT runs out of capacity. YSE is yet another reason why we have to make the RL a higher priority and get shovels in the ground earlier than currently contemplated. The squeaky wheel will get the grease, and York Region Council excels in squeaking. They believe that the only two things the construction from beginning are the funding and the installation of ATC on the YUS line which will solve all the woes of lack of capacity. (Sarcasm intended). As a resident of Richmond Hill, I have found that it takes me less than five minutes to convince someone up here that extending the subway to Steeles and building LRT from there north would be a better use of funds, and that all-day two-way GO service would be a far better option for those needing to get all the way to the financial district. Trouble is, I don’t have the time to speak with enough people to convince enough of them to convince our ever so concerned councillors of this. Steve: But (a) Richmond Hill “deserves” a subway and (b) GASP! you would have to transfer at Steeles. The Unilever station could be a double terminal configuration with platforms receiving N-S trains on one side and E-W trains on the other side. That would involve a transfer at the station but lessen the expensive sharp curves and additional real estate acquisition needed in one continuous big U line. Just a thought. The preferred route is Pape via Queen based on the article above. What are the chances of this changing to Pape to King via Unilever? Wouldn’t a station (Carlaw) closer to the beaches to feed passengers to and from downtown be a better station location than Broadview? The elimination of Broadview station would be satisfied by a station on the Unilever site. Steve: I plan a separate article looking at how the options were ranked. It is quite clear that the “experts” were trying to steer clear of SmartTrack and avoid the two lines in one corridor problem we have already seen in Scarborough. The resulting choice for the Relief Line is compromised as a result. You have confused two different figures. One is a peak load value, the other is peak hour boardings. All the same, the directly comparable figures generally show the route via Unilever doing better as this picks up a major employment node, even if SmartTrack is part of the equation. If SmartTrack at 5′ is impractical, the whole idea of using Queen as the east-west link will fall apart. I was more confused than that, but let’s not delve too deeply there. Whether you look at boardings, peak hours or total ridership, and even regardless of SmartTrack options, the King via Unilever route outperforms the Queen route by about 33% to 45%. Even with 5′ ST headings, Queen doesn’t measure up. So the lower Don crossing cost is either astronomically higher or is an excuse for trying to keep the RL away from ST. But as the report says, both ST and RL are needed, so the excuse has lost its rationale. These numbers are still preliminary, because some of the variables have already changed. But a 33% to 45% difference either doesn’t disappear, or the numbers are worthless. Other comments: I’m worried about the validity of all these numbers when they show an increase in RL ridership over baseline if ST has 15 minutes headways. The rationale is increased development spurred by ST. I don’t buy it, or at least I don’t buy it at a measurable level. I’m also skeptical of all the logic surrounding ST’s impact on Yonge at any headway. At 15 minutes even these numbers make Yonge relief not a good rationale by itself for ST. Basically there is a big boost for ST ridership only at 5 minutes (even over 8 minute headways, not seen in this report), and that boost seems too big to be true. It is quite clear that the “experts” were trying to steer clear of SmartTrack and avoid the two lines in one corridor problem we have already seen in Scarborough. The resulting choice for the Relief Line is compromised as a result. I surely hope that isn’t the reason. Two lines in one corridor should be a non issue given the existing and future conditions on the ground. We’re not talking about running two lines through a low density district filled with industrial warehouses, detached single family homes, and a declining B mall as its heart. But (a) Richmond Hill “deserves” a subway and (b) GASP! you would have to transfer at Steeles. (a) That is the collective group-think with RH council, as well as York Region council. Strangely, it was Markham’s Jim Jones who was the biggest promoter of the subway extension (that I refer to as the “Jones Express” in the same vein as the Vaughan extension is called the “Sorbara Subway” in some circles. (b) Trouble is, an across-the-platform or one-level transfer at Steeles would make for a much faster commute for 95% of people north of Steeles compared to the bus to subway transfer at Richmond Hill Centre that would involve two, if not three, level changes using the TTC’s highly available escalators. Only the very few within walking distance of intermediate stations would have a faster trip by subway. The benefit with LRT is that, for the same money as a Steeles-to-7 subway, LRT could be built from Steeles to Elgin Mills (including a 1 km tunnel north of Major Mac) plus a branch east along 7 to Leslie, or even to Woodbine. So many more would be far closer to a fast ride to Steeles with an easy transfer. Steve: Jones was also a promoter of a scheme that eventually morphed into the eastern leg of SmartTrack. His finances were a bit rocky, though, as he assumed that TIF benefits from all development in the east side of downtown to the Port Lands could be counted for TIF benefits from that one route. I’m appreciative of the detailed filtering and comments, though I haven’t fully digested them. I do have grave worries though, that the entire process of figgerings out is both skewed and fixated. The skew is from the presence of the Smart Track scheme, which has some merit in past plans using the rail corridors for transit, just is it viable with the existing RER and most of all does it overload Union Station (if all destinations must lead to Union)? The fixation aspect is “must have subway” – which I think could well be a stubway in the core, and missing the overload on the Yonge line as the problem. What can be done in this Yonge corridor to reduce and manage demand? Could we see a set of options? Like: boosting the express bus services, including on Mount Pleasant, the DVP, and even on Yonge St. itself, with a reversible rush hour busway, which would be “roadical”, yes. Can we feed some of the load that enters into the system at Finch on to the Spadina end of YUS? And what can GO do?? Steve: The backlog of demand we are facing compounded with expected growth and an attempt to divert trips from road to transit does not lend itself to an express bus service here and there. Remember that all of those buses have to wind up somewhere in the core with stops where thousands of people (if this is to have any effect) will be waiting for their return trips in the PM peak. I’ve also seen an option to improve access/transit from the Thorncliffe Park area to the core by linking a bus route to either Mount Pleasant through relatively natural areas, but also to the owned-by-Metrolinx rail spur by the Brickworks, that allows for a crossing of the Don, and then goes parallel to the DVP to the core. Steve: Actually that route is too narrow for a busway, and the unused CPR track switches to the west side of the river and shares the right-of-way with the active Bala Subdivision (Richmond Hill GO). You’re not going to “the core” with a bus on that alignment. The fixation with having a 60 year old (or perhaps 100) plan as the basis of having a costly subway is not so wise – East York was hardly built up; and now there’s Scarborough! So IF a subway should go in this area, it likely needs to be put in on far more of a diagonal, ie. more at Greenwood, and then go further on, yes. And let’s just remember: federal deficit bigger; huge debt load of Ontariowe; the City of Caronto won’t budget for even a tiny bit of user pay for the vehicles, estimated in one older report at $2700 per car per year of avoided subsidy and externality. We need to be thinking far more of Keep It Simply Surface for both speed of delivery(doing) and cost-effectiveness. Trouble is, an across-the-platform or one-level transfer at Steeles would make for a much faster commute for 95% of people north of Steeles compared to the bus to subway transfer at Richmond Hill Centre that would involve two, if not three, level changes using the TTC’s highly available escalators. That’s hard to believe. Sure, a 2 or 3 level transfer takes longer than cross-platform or 1 level transfer, but the at-grade LRT will eat that up getting through Thornhill congestion, and will have more stops. Plus just diverting off Yonge to the RHC terminal takes the current buses (and future LRT) time that is moot for a subway. The benefits of LRT lie in flexibility, cost (and therefore coverage), not time. Having said that, a cross-platform transfer at Steeles would be a dream after the time-killing Bishop St. Bus Terminal at Finch Station. A YSE to Steeles with that kind of LRT connection would cut 6 or 7 minutes off the commute, before accounting for LRT savings over bus north of Steeles. As for how far north the LRT would go. Bernard seems like a good candidate. Some day, it would be nice to see rail return to Oak Ridges – where it ended when my grandparents eloped on it in 1924.